Paul Phillips (left) and Walter Hardy work with young men at the Paul G. Stewart Center at 41st and King Drive. BRONZEVILLE — Before Morgan Park native Paul Phillips launched his male mentoring program, he had his lessons prepared, but not the lure. The Better Man Than Me Foundation began as a leadership training program six years ago, but Phillips said he knew right away that the format wasn’t going to work. So he tweaked the program, bringing the guys to restaurants. Then he tweaked it again, letting them play basketball for part of the program. Since the early testing period, the program has been successful, serving more than 4,000 young men throughout the Chicago area. On Aug. 4, the foundation will host a scholarship event at the Lighthouse, 4338 S. Prairie, to raise $5,000. The funding will go to young men entering their first or second year of college. Last year seven scholarships were awarded. But once he incorporated basketball into the monthly sessions, things flowed much better, Phillips said. They would play basketball for half the time and then take a 20 minute break and listen to a guest speaker. Those varied from police officers, ministers, entrepreneurs and more. 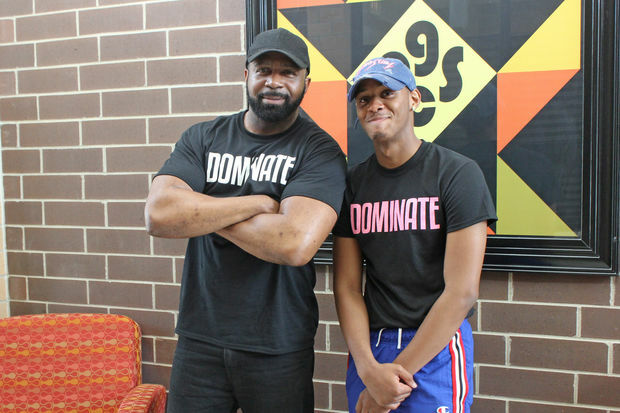 This summer, the organization is hosting a mentoring program for the Paul G. Stewart Center at 450 E. 41st St.
Justin Smith, 10, of Bronzeville, has been attending and he said he’s learning a lot of lessons that he practices when he’s at home. He likes playing basketball and has learned how to be “a good teammate” and apply teamwork concepts on the court and off, like helping his brother clean up at home. Walter Hardy, 18, from Lawndale, has been with the program since the beginning. What piqued his interest was the basketball, he said. He said he began to appreciate the other components of the program. “They always set aside time for a man to come in and talk to us about any and everything,” Hardy said. “[This] is bringing people together and uniting young black men to just talk. That’s stopping the violence. The basketball is the attention-getter. I believe with any program for the youth, you need something to catch their attention at first,” said Hardy. Hardy will attend Iowa State University in the fall and will continue playing basketball. He’s been volunteering during his summer vacation as a mentor. “Better Man Than Me is a great program and I’m a result, I’m a product of it, and it’s a million other young men that will be touched by this program too,” he said. Phillips launched his nonprofit with the mission to promote success and responsible stewardship among young men ages 12 and up, he said, adding that it’s about fostering personal and educational growth. Phillips said he wants all the men who come through his program to understand how to build meaningful relationships. There’s mentoring for music and vocational and educational training. The organization offers its participants resource-planning skills as well. The curriculum has been introduced to more than 15 schools throughout the city and suburbs. Phillips said he’ll bring the program anywhere it's requested. His ultimate goal is to create his own youth center. “We believe that if we want to change the future, we must start by giving our youth the opportunity to be better than we are,” Phillips said. The organization is always seeking male volunteers and donations. Learn more at www.bettermanthanme.org.